Getting my new cookbook off the ground last month meant having to reach out to others and ask for help. As many of you know, that’s not always an easy thing to do, but these wonderful bloggers (listed below) accepted my request with open arms. And for that I thank them from the bottom of my heart! So what better way to send them some love back than to ask you to please take a few moments to click on the sites that sound interesting to you? I know we’d all appreciate it, and who knows, maybe you’ll come across a new blog you really like! I hope so. 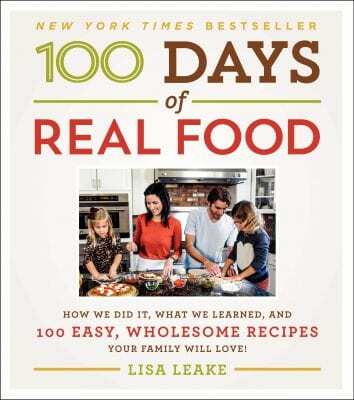 Lastly, here is the new cookbook cover with “New York Times Bestseller” added to the top! Super exciting stuff, and this definitely would not have happened if you didn’t go out and buy the book. So thank you, thank you, thank you for that!! It was such a pleasure to review the book Lisa! Thanks so much for the opportunity and the fabulous book. I was even able to lend my copy to a good friend who is looking to start her own real food journey and she loved all the recipes as well. Thanks again! Thank you so much for a copy of your book, Lisa! I loved reading it cover to cover and then reviewing it on my blog! I’ve already made five recipes and I can’t wait to keep working my way through the rest of them. (There just aren’t enough meals in each day to try them all as quickly as I want!!) :) Congrats on your success with it–it’s very well deserved! Lisa, I am over the moon excited to see “New York Times Bestseller” at the top of your book. We (your fans) all knew it would be a huge success. The best part of the book is that you are authentic throughout. You inspired me to begin my real food journey and to share the word of real food through my own blog. It is a pleasure to review your book and celebrate your success. I look forward to celebrating further success with you. What a wonderful compliment – I am so glad to see it come to life and share it with all of you. Thank you so much Christina! your cookbook just arrived with me, over here in Singapore. It looks amazing and very informative. Congratulations on becoming a New York Times bestseller- you sure do deserve it after all the hard work you have put in. Your recipes have changed my family’s life around and I am extremely grateful to you. I have gone from being a total non cook, who had no confidence in the kitchen to someone who puts an fresh, home-cooked evening meal on the table for my family every night …… but not only that I know feel more confident about cooking and enjoy it. my husband really can’t believe it and it is all down to your easy to follow recipes. I really thank you from the bottom of my heart and am so so glad that your cookbook is doing so well. Wow, good for you Barbara – I am impressed and so pleased I played a small part in the transformation! :) Thank you so much and thanks for sharing. Lisa, thank you so much for the opportunity! I believe so much in what you are doing, and it has changed my life so much! The book is absolutely beautiful, it is obvious you wanted to make sure it was more than just a simple cookbook. Wonderful job! Your FB post irritated me and I chose not to comment, then I started thinking. Why am I not doing this? I love your blog and recipes, but I am not all in or even one foot in. So, I think the FB thing irritated me because I had to ask myself why I am not doing what I know is right. So, thanks! Really, thank you! I ordered your cookbook today and made the 5 minute brownies. Baby steps, right?! Ha! I appreciate that you ask the hard questions and how hard you and your team work to post truth! I read your cookbook cover to cover the last week of summer holidays and enjoyed it get much. Great info. Great recipes. I’m so happy for you! I’ve been following your blog for a long time, it’s been like watching a seed turn into a beautiful rose bush! I got your book from the library this weekend. It is a wonderful book that I think many people will LOVE! I have two kids also, so it’s great to see a cookbook with recognizable and easy to find ingredients. I’ve added the book to my Amazon wish list for the future. Good Luck with the book!